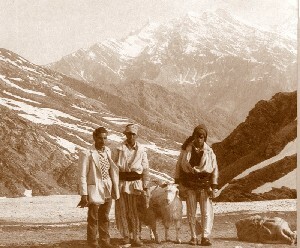 This is largely an account of my experience on the spring, northward migration of the Gaddi shepherds of Himachal Pradesh; from Kangra over into Bramour, Chamba district. But first I should mention something of who the Caddis are and why they migrate. Gaddi shepherds are not nomads. They have homes, substantial village houses, and they own land which they or their family cultivate, Their homeland is Gadderan, Bramour tehsil, in the west of Chamba district. It comprises the valleys of the upper Ravi and its tributary the Budil which form a V meeting at Karamukhjust below Bramour. These two rivers here run more or less east-west and divide the Dholar Dhar range to the south from the Pir Pinjal to the north. Karamukh, the lowest point, is 4,500 ft., the high peaks to the north over 19,000 ft. and the valley sides and high alps are precipitous and inaccessible. The only road into Gadderan is from Chamba, 50 km of a narrow, untarred, precipitous 'fairweather' road The country is surmounted by Mount Kailashl. 18,500 ft., the seat of Lord shiva and his consort Parvati. Gaddis are staunch Shaivites and wherever they may wander, feel an unusually strong cultural and religious involvement with their homeland, also referred to as Shivbhumi, the land of Shiva. During the last hundred years or so many Gaddis have bought land and built houses on the southern slopes of the Dholar Dhar- the northern edge of Kangra valley but whether or not they stiU have land or relations in Bramour tehsil, they consider themselves as belonging to Gadderan. It is thought that there are about 80,000 Gaddi people. About half of these do not own flocks, and are agriculturalists only. Of the 3,000 or so men who accompany the flocks of sheep and goats, some take turns months at a time, in shepherding and in cultivation with brothers, uncles or sons. Others are away fron; home throughout the year except for a couple of weeks in the spring and in the autumn when the flocks pass through their own villages. It is nor the flocks that dictate the annual pattern of the shepherds' 1ives. The winter pastures are in an approximately horizontal line in the foothills, south of the Dholar Dhar , from Nurpur in the west to Bilaspul in the east. Here the flocks spend four or five months, moving only locally from a base. The terrain is scrub forest, semi-tropical jungle at 2 to 3,000 ft. Traditionally it has .been the extent of available winter grazing that has controlled numbers and the size of the flocks. However recent cultivation and the increase in the domestic head of cattle and goats are encroaching on these old pastures. The shepherds at therefore anxious to move north as early as possible, usually towards thc end of the month of chaet, about mid-April. But how early depends entirely on how quickly the snow melts on the higher passes and pastures. Last year, a year of particularly heavy snow, they moved a month or so later than usual. 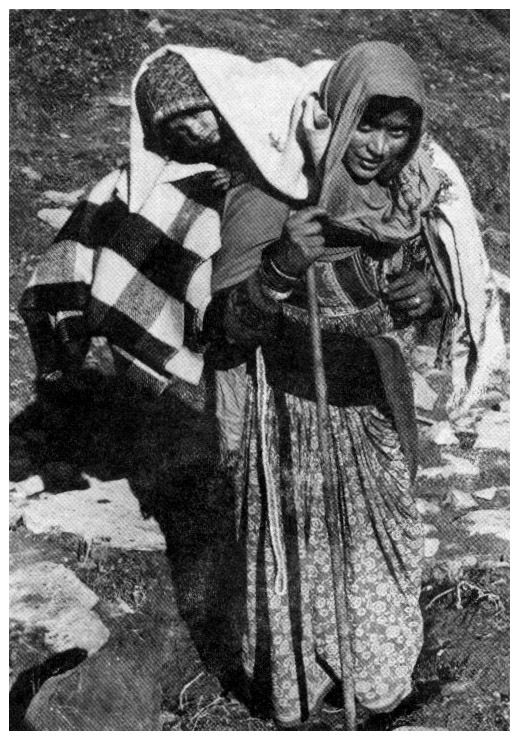 migration from Kangra over Jalsu, the lowest of the passes, and therefore the first to be clear of snow The way was crowded with flocks and men, also with women and children. For during the winter grazing months, as opposed to the summer, some families do accompany the shepherds and flocks Many others, in fact most of the Gaddi population of Bramour , emulating the migratory movement of their flocks, come down in winter to work with relations or live in rented accommodation in Kangra. 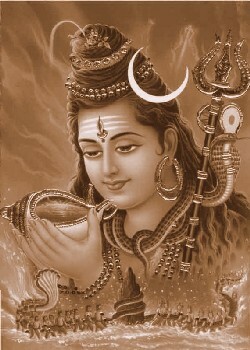 (It is believed that even Lord Shiva moves from his seat on Mount Kailash to winter at Pujalpur.) They were now on their journey home, some taking a week, some two or more to reach their villages. Everyone was full of chat. It was a real pleasure to be one of the company. I had a glimpse of what it must have been like on pilgrimages when large groups of people travelled on foot for days at a time. Canterbury Tales-style jokes and incidents that you have all shared are retold and embellished. Snippets of an old woman's life and anecdotes about her relations soon make you feel you know her well. There were men and women who looked old enough to have crossed this way twice a year for three score years and ten, and there were babies of a few weeks. Then there were the winter's purchases being taken home -chickens proudly carried in the crook of an arm; handsome spotted house goats with large udders; Jersey-type heifers and young bulls; baskets; winnowing trays; Image By P R Bali plastic jerry cans; brightly-coloured nylon sweaters; radios; dholkis, drums. Babies and young children are carried sideways, across the rest of the luggage on the mother's or father's back. They are often not tethered in a shawl, as is normal in the hills, but perched, the parent casually holding on to a leg or foot while the child's head dangles on the other side. Not everyone walks exactly the same stage every day. Those with flocks and too many young children or the old and infirm cover a shorter distance. Or, like the old man and his daughter, the pleasure of whose company we had the first morning, they may be detained by friends or relations met along the way. when we were all dozing after lunch our companion came to say how very much he had enjoyed our company, as we had his but that the relations with flocks he had met here would not let him go any further that day. He hoped we would meet again. We did not think we would but several days later at 5.30 am when we were packing up camp before climbing to the pass he appeared on the skyline with his jolly, plump daughter puffing and panting and holding up her skirts. The day starts early. Up before dawn and off soon after, walking with plenty of rests and chats, until II or 12 o'clock when everyone stops to eat, and maybe to cook, and then to smoke and snooze. Some walk another two or three hours before settling for the night's camp. In places there are what we in Scotland would call 'sheilings', though more often the travellers shelter in caves -there were plenty on our route. Everyone carries blankets. Most of the hill women of Himachal are free of the restrictions of purdah and excessive modesty but the Gaddis or Gaddi women seem to be particularly outgoing, friendly and full of self-confidence -not just towards me, but to everyone, men too, The only exception is that in the presence of any of their older male in-laws they immediately cover their heads. They wear a distinctive and attractive dress; the long, gathered skirts reminiscent of the clothes depicted in old wood carving and miniature pictures of the area. Over their head they wear a cloth, usually decorated with floral embroidery which they work themselves. They have large earrings, gold or silver, solid gold nose pieces, necklaces of amber, silver, gold and pendants with fine enamelling- often depicting Shiva and Parvati -or plain silver embossed pieces commemorating their ancestors. Their chins are patterned with a finely marked, circular tattoo, sometimes their hands and arms too. Some wear a coat-dress of white homespun tweed down to the ground, the lapels decorated with an embroidered flower. The more fashionable version is a velvet blouse with broad cuffs, joined to a very full skirt, reaching the ground, of colourful chintz. It takes twelve yards of cloth and is forty four feet at the hem which is lined with a contrasting colour and stitched round and round many times. Whatever the style of the chaura, dress, it is waisted with the dhora or woollen belt. The long chaura is cumbersome to walk in, they often have to hitch it up. 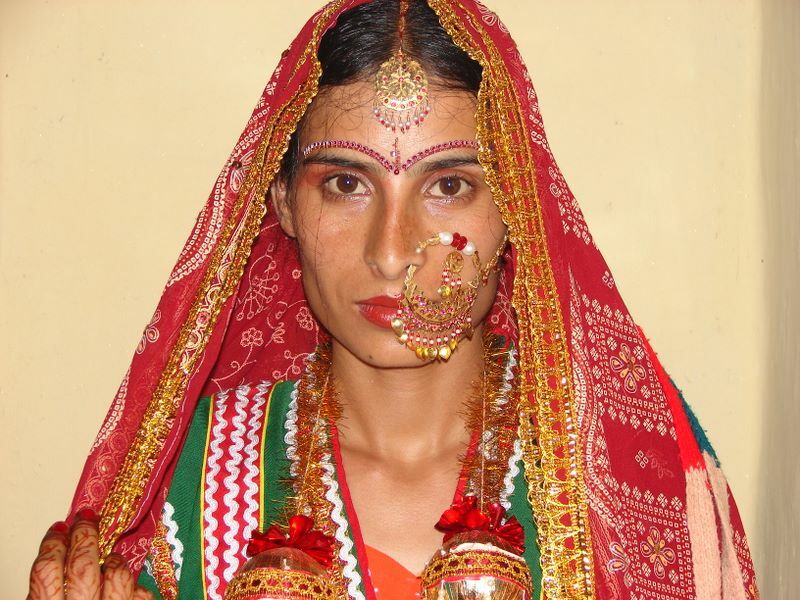 But a Gaddini does not like to be seen out and about without it, though at home she often strips down to the Punjabi- style salwar and kameez, pyjamas and long overshirt, which she wears underneath. On the end of her plait, on the blouse fastening, and often pinned on the shoulder too, are the circular mirror medallions, decorated with buttons and beads' that Gaddinis make and often give each other as expressions of affection. Every woman I met asked me where my children were. Everywhere in India a barren or unwed woman, is an object of pity, but the Gaddis go as far as having to erect stones to quieten the spirits of childless couples who disturb others' sleep. I was relieved to be able to say my children were safely at home. It is hard to describe fully the all pervasive sheep and goatiness of that journey. Whenever I glanced at a distant hillside, vaguely looking at the skyline or the precipitous rocks, I would realise it was 'lifting' with the milk-white flocks. Clustered in an irregular circle round a midday camp, moving imperceptibly across the hillside grazing or following each other along an invisible path, like maggots on the move. Nearby the endless baa-ing and bleating, the calling, grunting and whistling - the whistling not as we would imagine to their dogs but to the goats and sheep. One man always leads, calling and whistling, another always at the back, grunting and urging on the stragglers. As you walk along the path the stink of wool and dung is overwhelming. Their sharp little hooves eat away the path and the dung makes the rocks slippery .If you are caught among a flock on a narrow path it is maddening for they move at an irregular pace, their walk slower than yours, but then they suddenly run on and those you had with , difficulty pushed your way past, have overtaken you. In camp the baa-ing and bleating is all around, and the dung everywhere (and immediately inside your tent). The vegetation is rank, nettles, docks and thistles that grow where flocks habitually camp. We reached the top of the Jalsu Pass at about eight o'clock on a clear morning. I had climbed the last steep stretch chatting to a new behinji, sister, with a small baby, her husband and brother-in-law and their flock. One-young male goat had to be pulled up and then down the pass by the scruff of his neck. He had eaten kashmiri patta, Rhododendron campanulata, which they do when hungry for fodder and which makes them drunk. If several of the flock suffer at once it causes the shepherd considerable inconvenience. We sat on the snow at the top gazing at the sheer white beauty of Mount Kailash. No one performed any prayers or sacrifices but all were impressed by the view and by the first glimpse of the hills of home. My new behinji 5 brothers insisted on my photographing them with their largest male goat set against Mount Kailash. Then, 1,500 ft. down below, we settled on the gentian and primula-enamelled turf and shared chappatti, of wheat or maize flour , and nettle and bracken vegetable. We waited for a sad and lame old man, who had recently sold his flock and who was finding it hard to negotiate the steep snow. So was a very fat and prosperous woman, wife of a Brahmin travelling with four or five young girls, cows, goats, and newly purchased household goods. But everyone had the breath of home in their nostrils and were soon off trippeting down through the rhododendrons -they had now taken off their goat-hair snow socks. That night was particularly noisy. My new sister walked up and down the path her baby screaming; after that day's exertions she had no milk for it, neither did their goats. We gave her some dried milk but it obviously was not appreciated as the baby cried all night and so did all the kids and lambs. The Gaddis are staunch devotees of Lord Shiva and Parvati, in her many guises, as the following incident illustrates. Before reaching the Ravi river, I and many others, men, women and children, were coming down a 1,000 ft. drop to cross a tributary .On the opposite side the path was equally steep. Halfway up it a shepherd began to take his flock off the track. They scattered across the precipitous hillside to graze. One of our Gaddi companions bellowed across the gorge ordering the shepherd not to do so as stones would fall-on the people climbing up. The shepherd paid no heed; We all settled on a rock on the nearside to wait until the flock moved on and the danger of falling stones was over. As we watched, a fully grown sheep came hurtling down through the air, legs stretched out, and fell with a deathly thud on the path. It was an aweful sight: everyone gasped. And then, in the river bed, when we did cross by a rickety bridge, the new PWD one having been washed away, there was a newly dead cow with a broken neck. On the far side at the top we found there was a temple to Lakhna devi, a form of Parvati, the presiding deity of the area whose power had just been so dramatically illustrated. One of the shepherds of the ill- mannered and ill-fated flock was sitting by the temple. He was roundly abused. 'What do you think you were doing, taking flocks across a hill like that in the middle of the day with mothers and children walking up the path below? What sort of Gaddi do you think you are? See, you have no respect for the devi. And it was also explained hat the owner of the cow, nearing the end of his five day journey from Kangra, was drunk, had lost his temper and hit his cow on the steep slope which made her lose her balance and fall to her death. All agreed that in the face of such wanton lack of respect, the deity was justified in asserting her power . As we reached cultivation, gradually our companions began to peel off. The fraternity of the pilgrimage spirit began to loosen as the excitement of nearing home increased, 'Kangra is better than here in the winter, but there you never feel hungry. It's the water (we would say "it's the air"). Here you enjoyed your food. Here the mountains go straight down into the river gorges. From the bottom of the valley you can see nothing, only hear the infernal noise of the river; in fact it is difficult to imagine that there are villages above. But up at the level of the major villages, 1,000 ft. or so above, there are views on a scale that defy ordinary visual conception and mock the camera's lens. Shiny snow peaks are clearly chiselled in the morning or evening sun; one-dimensional and ethereal in the moonlight. Waterfalls cascade in white sprays down the rock faces. There are dark forests of deodar, spruce and fir, particularly on the north-facing slopes. On the south-facing slopes, the alps, sometimes even very high up, are stripes of deep green or yellow: These are tiny cultivated terraces, some so narrow that the terracing has to be open-ended to allow the bullocks and plough to turn. Some must be dug by hand for the bullocks could not even walk on the precipitous slope. The villages which had been shut up for the winter had a slightly haunted feeling. Will the owners reappear? The heavy wooden doors are padlocked, the locks dusty from disuse. The house shrines in the courtyards obviously unattended. As all the cattle are left in the charge of the few families who remain, the byre doors which are on the ground floor are plastered over with mud and dung; sometimes crumbled at the corners by hungry rats trying to get in. The only signs of life were the bees flying into their hives - hollowed sections of timber set into the walls. The owners do not arrive all at once, but spread over a month or so. There was no flurry of excitement, nor outward signs of emotion. The greeting of a younger to an elder, as in India everywhere, is to touch the elder's feet. Hence between family members they touch the feet and then embrace, on each side twice. I saw a young shepherd returning with his flock climbing the hill. Seeing his sister-in-Iaw on the stone balustrade of the house he took a red hankerchief out of his pocket to cover his head before greeting her. Schoolboys, twelve or thirteen year olds, were climbing the 1,000 ft. from school, poking, their hands down into the stone seat by the temple where they had left their, very unripe, apricots when on the way to school in the morning. At that moment an elder brother or cousin came along the hill with his returning flock. There was no greeting, no sign of joy on either side, but 'Hey, Chandu, take my luggage home', and he dropped his blanket-wrapped pack on the path for the young fellow to pick up.Heaps of manure, accumulated the previous year and matured during the winter lay in the yards or on the path, ready to be carried out to fertilize the maize fields. Bedding quilts, made of old bits of tweed blankets roughly quilted, were spread out in the sun to air. Fields must be ploughed, grain that has been stored all winter cleaned and dried, and flocks must be clipped before they move on away for the summer. But there was no bustle or hustle; plenty of time to sit on the verandah or on the stone balustrade and gently smoke a hookah and chat. Witnessing this calmly congenial scene it was hard to imagine that for the shepherds it was but a brief interlude. That within days they would move on north and up to the summer grazings -handed on from generation to generation, taxed by the forest department and sometimes by the villagers too. Some move to high pastures not so very far from home, but still with dangers of avalanches, crevasses, falling stones, and bears. It is a life of discomfort, with the constant necessity of keeping an eye on each sheep and goat. Others must walk Over the 16 to 17,000 ft. passes, and perhaps hundred miles to graze their flocks on the 'blue' and nutricious grass of Lahoul and Spiti, even to the borders of Ladakh and Tibet. There to spend two or three months in a treeless land, their food, goat's milk and parched barley flour that requires no cooking, or sometimes dhal and rice or makke ka Toti, maize chappattis cooked on acrid smelling yak or cattle dung. They have no shelter but their blankets and kilted white homespun cloaks, sometimes a dry stone igloo. The only sounds that relieve the monotonous baa-ing of their flocks, the cold wind and their own flutes. As I sat envisaging their summer, something that had been gradually occurring to me became quite clear . Gaddis may consider shepherding their dharma given to them by Lord Shiva. But it is not just that that makes them follow their ancestors' migratory life. Nor , is it a love of it (to me a romantic life). It is the prosperity that the sheep and goats bring -the former largely from wool, the latter from meat. If the Gaddis lived solely from the cultivation of those tiny strips of terracing there would not be so many newly built houses on the opposite hill, shops filled with shoes, cloth, dalda and suchlike, nor women laden with jewellery, nor substantial land owned by them in Kangra. And were it not for their comparative prosperity and their travelling habits, combined with a pride in their homeland and culture, would they have the outgoing and friendly manner which had made this journey such a pleasure for me.